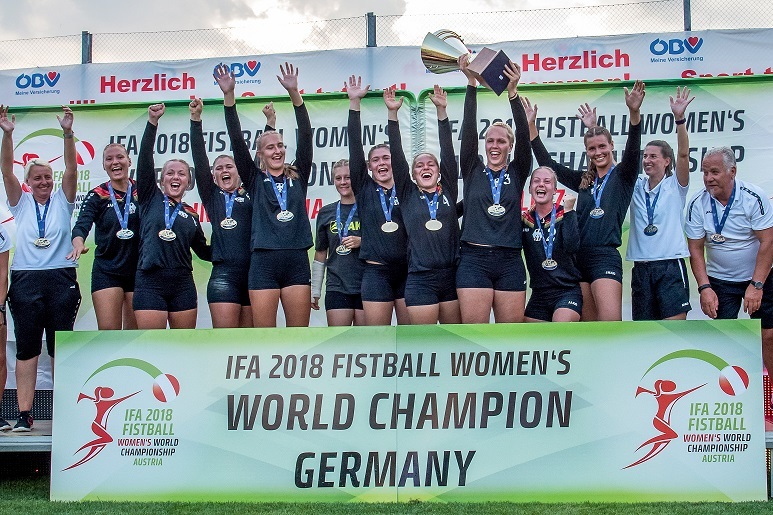 Germany has defended its title at the IFA 2018 Fistball Women’s World Championship. The team of coach Silke Eber won the final on Saturday evening with 4:1 against Switzerland. Brazil secured the Bronze medal with a 4:0 victory over host country Austria. The first two sets in the final were a tight matter. In the first set both teams were tied until 9:9 when the German attackers Sonja Pfrommer and Stephanie Dannecker scored and secured the set for their team. Switzerland started strongly into the second set and pulled ahead until 9:3. Germany bounced back and was able to defend three set points. However, the Swiss team stayed calm and equalized to 1:1 in sets. Over the next sets, both teams showed a strong performance in their defenses. 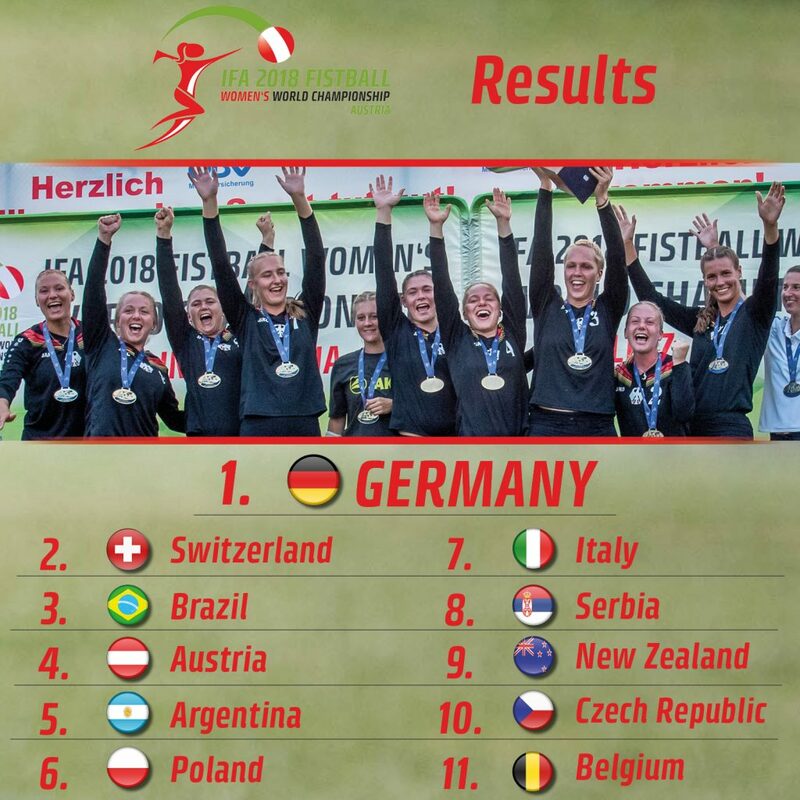 Germany was more often able to score the decisive points, and secured its sixth World Championship title, the third in a row. “It feels incredible to have won the title again. I can’t believe it! I think, I’ll need a week, a month or more to realize it. 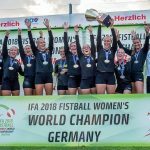 I’ll have to go over it again and again, then, maybe, I’ll realize it”, said Anna-Lisa Aldinger who was already a member of the German team at the last World Championship in 2016. “I think, if you get to the finals, you wanna win it. We wanted to. The first two sets were great. Of course, we are disappointed, we wanted to beat the World Champion. We haven’t been to the finals since 2002, that’s something we can be proud of“, said Swiss attacker Tanja Bognar who played a great tournament. Brazil scored a clear 4:0 victory against host country Austria in the match for the third place. It is the seventh medal for the Seleção at a World Championship. After a close match in the first set, the Brazilians gradually took control of the game and established a 2:0 lead in sets. In the third set the Austrian squad had the chance to turn the tide, but was not able to seal the deal – following a 9:7 lead, the match went until 14:14. Brazil converted the set point and expanded the lead to 3:0 in sets. The Brazilians also won the fourth set, attacker Tatiane Schneider scored the match point. The Brazilian team thus won the Bronze medal, while host Austria had to settle for the fourth place. “We are happy and satisfied with our performance”, said Brazil’s Isabella Lucchin who played a great tournament along with Tatiane Schneider, her partner in the Brazilian attack. “However, we wanted more”, Lucchin added in reference to her team’s narrowly lost semi-final game against Germany. “It was great to play in front of our fans. We are still a young team, and I am sure one will have to count on us in the future”, said Austria’s captain Karin Kempinger. Argentina secured the fifth place in the tournament with a 3:0 win over newcomer Poland. Italy finished seventh, and Serbia eight at their first World Championship. Another newcomer – New Zealand – won the inaugural President’s Cup with a 3:0 victory against the Czech Republic, thus taking the ninth place. Belgium, who also played its first World Championship, finished eleventh.